To make the caramel sauce, put the sauce 1. ingredients in a saucepan, bring to the boil and allow it to bubble gently for 30 seconds. Set to one side until needed. Put the flour, sugar, eggs and milk in a bowl and mix well. Add the chopped strawberries and gently stir. Heat a little white Flora in a frying pan. Once hot, add the pancake mix, 2 tablespoons at a time, in order to make small pancakes. Cook one at a time, browning both sides and turning with a fish slice. 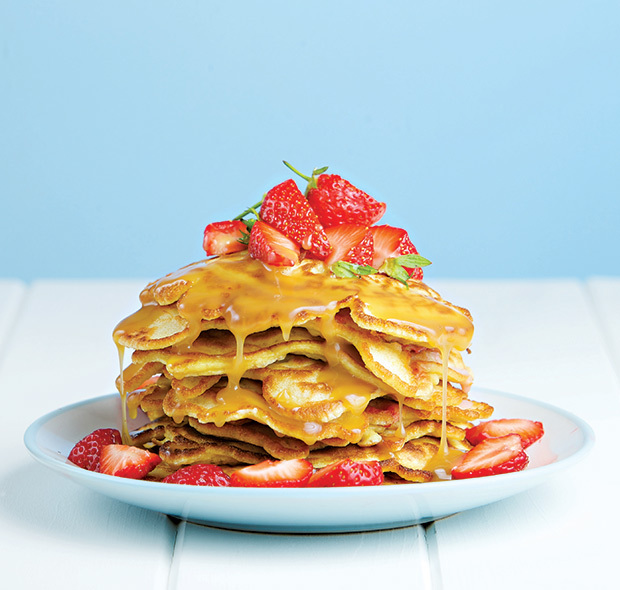 Serve the pancakes with the extra strawberries and the caramel sauce.